Yet again i was in London for a few days. It was a really spontaneous trip and i forgot to tell a lot of people i was going apparently. When i got home to my precious internet i had a few messages on facebook from people who were confusted about where i was. Sorry about that! 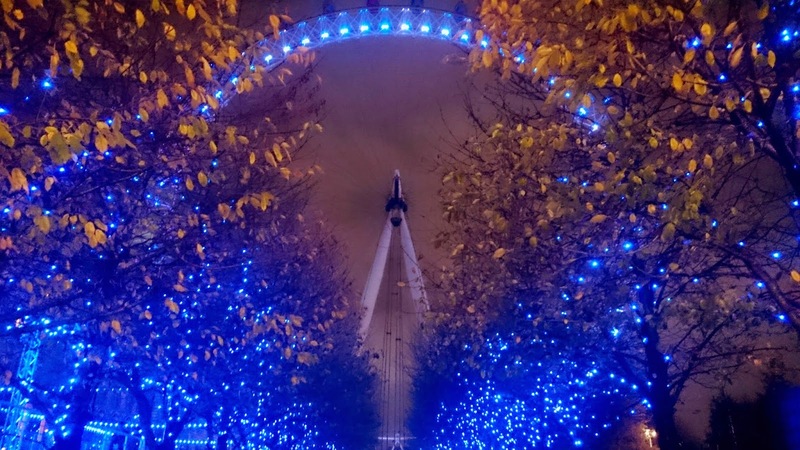 It was a few days of Christmas shopping and just to see how London looked like at Christmas. I was not disappointed but it was still not what i was expecting. I though there would be more decoration in an old fashion style but it was mostly very modern decoration. I think blue is 'in' this Christmas by the way. The first day we went to the Cinema to see the third Hunger Game movie Mockingjay in Odeon Cinema Surrey Quays. After that we took a little walk around the house of Parliament, London Eye and ended up at Trafalgar Square. We met a really nice homeless man from Ireland on our walk actually. We just stoped and talked for a bit. I don't really know why. Second day was Oxford Street and late visit at Hard Rock Cafe. Yet again. I'm there every time i'm in London. I always order the legendary burger because it's legendary good! And i have to mention that they played Black Veil Brides while we were there! Heaven! The third day we went to see Platform 9 3/4 and i had to buy some Harry Potter books i needed in my collection. 'Fantastic beast and where to find them' and 'Quidditch through the ages'. It was on our way to Camden Town. Still as confusing as always. Then we went to Soho and Chinatown. We both love everything Asian. Manga, anime, culture, you name it! It's a really great and nice place to get lost. Which we do almost everytime we are there... ermh.. It was a great trip! We walked so much that our feet were pulsing at the end of the day. It was a hard time i tell ya! I will write some more details about the trip later, but this is just a quick overview of what i have been up to the last few days!